The Pyrenees have long been considered one of the top areas for skiing, with numerous ski resorts which also cater for other winter sports, including snow boarding, often in brilliant sunshine and always with awe-inspiring views. Couiza nestles in the warm, temperate Aude valley, between Limoux and Quillan, which means that snow doesn't usually settle here, so if you're planning on a winter visit, you'll only need snow chains if you're going to go up into the mountains. The nearest ski resort, 27 miles away, is Camurac, with 16 downhill pistes and 14 km of cross-country ski tracks. 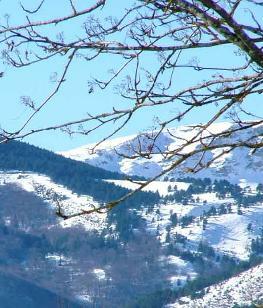 Buses go every half hour from Quillan during the skiing season. 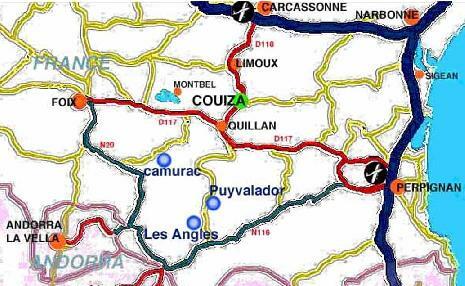 Slightly further afield are Puyvalador and Les Angles, as shown on the map below. There are fine pistes suitable for beginners through to experts and also off piste routes for the more adventurous. Ski passes are available from 12 Euros a day, depending on season and resort. Please contact individual resorts for prices and cost of ski hire. Visit puyvalador.com or lesangles.com for info on the local pistes. For more ski resorts in the Pyrenees yet still within reach of Couiza visit ariegepyrenees.com. Many of the summer attractions are also available at other times of year, please see the Summer page or the links on the left for more information about Aude, Languedoc-Roussillon and South France. Gite des Cathares is a spacious gite in Couiza, with central heating, a wood-burning stove on the 2nd floor and double glazing to keep it warm all year round. Ideal winter holiday accommodation.